Teams, though usually more media and fans, talk about certain games as so called measuring sticks, like when you play the best. It’s a look at perhaps where you rank in the league, how good you really are, your needs. A long road trip, particularly across multiple time zones to the opposite conference, also can be as meaningful and illustrative. So Friday in finishing their two-week road trip 4-2 with a 105-89 victory in Philadelphia, the Bulls made an early statement of their own. It’s really an excellent start, and though we still have to use the “small sample” disclaimer with a 10-6 record, the early reviews show the Bulls surprisingly one of the strongest teams in the NBA. “You walked into that gym from the get go and you knew you were going to be in for a fist fight; a physical team, a bunch of men, All-Star men, championship men,” 76ers coach Brett Brown said about the Bulls. The Bulls are tied for second in the Eastern Conference with Toronto and Atlanta, three games behind Cleveland. That despite the Bulls leading the Eastern Conference and tied for the NBA lead in road games with 11. And in two of the principal metrics that predict overall success, the Bulls rank among the league’s elite. Though a team with nine new players and a revamped starting lineup with only one player who was a starter at the beginning of last season, the Bulls have a margin of victory of plus 6.3. That’s second in the East to the Cavaliers and fourth overall in the NBA. A season long 6.3 margin of victory usually translates to 55 wins. Another crucial indicator is road wins versus home losses. In that ratio, the Bulls are plus-5, which leads the Eastern Conference and is third overall in the NBA. The Cavs only have played four road games, so no one is suggesting quite yet that the Bulls are the class of the East. But the Bulls on this trip with two narrow losses, to the Clippers and in Denver, have provided an early encouraging assessment of their own. It was a dominating game for the Bulls from the start, this being one of those in which there is usually an easy excuse available of fatigue, that in the 12th day out including Thanksgiving on the road, having traveled more than 5,000 miles and been in and out of a half dozen hotels with side trips, like Wade to New York to celebrate Thanksgiving with friends. 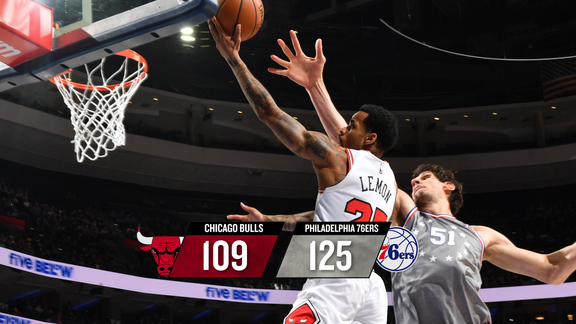 But, instead, the Bulls piled on the (still) building 76ers from the beginning, an 8-0 start, then 11-2, and making it a game in which the 76ers would only be close early in the second quarter. 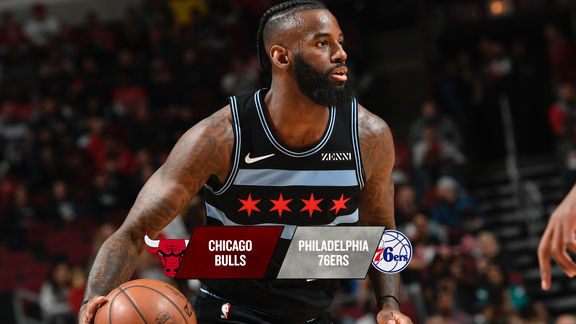 The Bulls led 23-19 after one quarter, and then with a second quarter run of 17-4 banging it inside for free throws after the 76ers got into the penalty early, the Bulls led by 10 at halftime. Led by Taj Gibson powering inside to start the second half and then Butler picking it up driving the ball and then the bench closing it with Denzel Valentine and Nikola Mirotic threes, the Bulls blew out to a 90-64 lead after three quarters. Wade had some fun to start the fourth quarter after Jerryd Bayless started taunting him. Wade isolated for a jumper that started an 11-5 run of his own, scoring all 11 Bulls points to start the fourth quarter for a 101-73 Bulls lead four minutes in. Both teams pretty much said good night after that, a much better one for the Bulls as they finally headed home. Gibson had 12 points and six rebounds, Robin Lopez had 10 points and five rebounds and Rajon Rondo had six points, eight rebounds and 10 assists. He and Lopez were both crucial on defense in both registering team bests of more than plus-25 in the game long plus/minus. And a great overall trip for Butler, who picked up the NBA Player of the Week award and as these small samples go elevated himself into the league’s MVP race in a serious way. Butler has moved up to 10th in the NBA in scoring, and with the way the Bulls are playing, a team most supposed experts predicted was not even a playoff team, Butler probably is in the top echelon of the MVP race along with LeBron James, Kawhi Leonard, DeMar DeRozan and James Harden. Kevin Durant and Stephen Curry now cancel one another out and Russell Westbrook is with a .500-type team. Butler is averaging 25.8 per game on the season along with 6.6 rebounds and 4.1 assists. On this six-game road trip, Butler elevated his game to average 28.3 points, 8.2 rebounds and 3.8 assists along with 9.7 free throws per game. He did it with a powerful midrange game averaging one three pointer made per game while scoring at least 20 points in each of the last 10 games. The 76ers were without their best player, rookie Joel Embiid, who is not playing in back to back sets after missing two years with foot injuries. They’re now 4-12 and still trying to escape the bottom of the NBA. Chicagoan Jahlil Okafor started for Embiid and was mostly overmatched on both ends with 10 points and a minus 27 when he was on the floor. 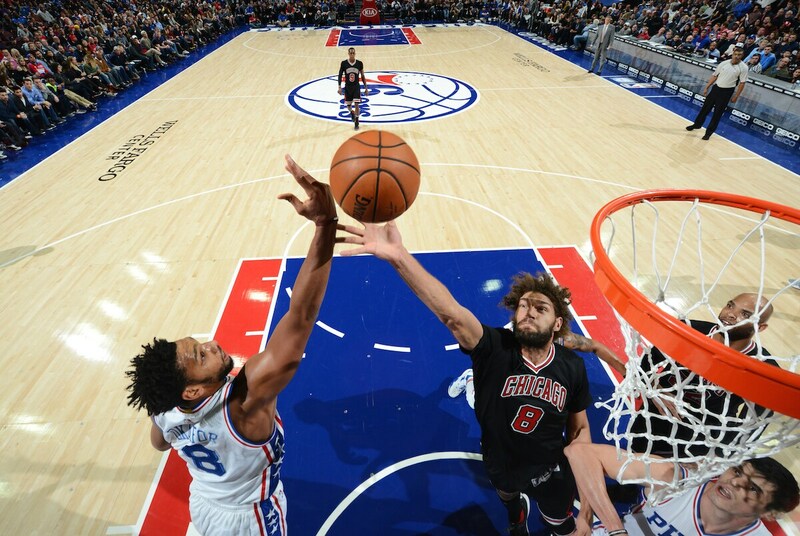 After the Bulls took that 11-2 lead, the 76ers scored six straight points. So then it was to Butler, who drove for a two handed dunk off the wing and pulled up for a three. Isaiah Canaan then hit the first of his two threes in the quarter on an upcourt pass from Rondo. 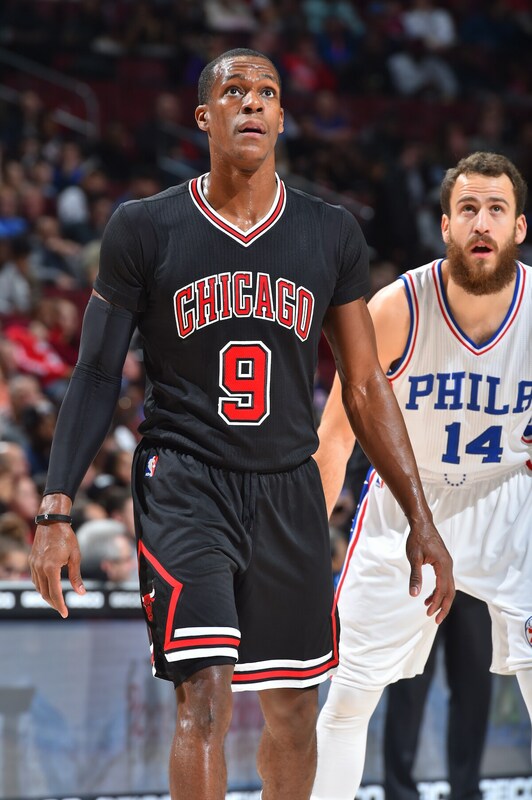 Rondo had one of his better games not only pushing the ball, but was aggressive on defense. An example was midway through the second quarter when he battled over screens to force the ball out of the hands of Bayless that turned into a charge and a pair of forced misses. Those sorts of plays are overlooked. The Bulls generally switch on the perimeter, so there isn’t as much opportunity to fight over screens. But with his long arms and slight build Rondo can do that when he’s motivated. And he was in Friday’s game. Rondo also was adept in the half court finding mismatches on the inside for easy baskets for teammates. He likes to say he can dominate a game without scoring, and though the way Butler and Wade played it would be difficult to say that, Rondo had one of his stronger games. The Bulls got a good contribution from Bobby Portis in the second quarter, picking up a loose ball and driving for a slam dunk and scoring all six of his points in the quarter. 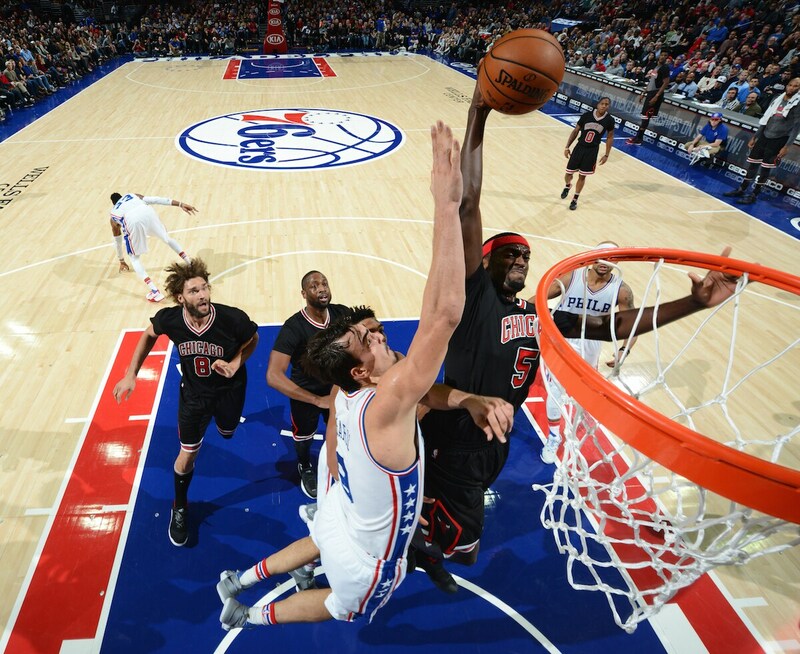 The Bulls bench was better, though still outscored by the 76ers’ 47-25. Though the 76ers starters were mostly awful, leading to more time for their reserves. The Bulls got a bit of a setback with news that Michael Carter-Williams is suffering from swelling in his wrist. His injury Oct. 31 was primarily a sprained knee. There also was what seemed a minor wrist sprain. The Bulls Friday announced he “still has a significant amount of wrist swelling.” A bone chip was identified. The Bulls said Carter-Williams still remains on the original four-to-six-week timetable for being out. He is wearing a cast and will be reexamined in two weeks. Also, Doug McDermott remains out with a second concussion. The league determines the diagnosis, treatment and timetable on concussions. So the bench will remain weakened. But the starters have been excellent and now the Bulls have four off days before playing the Lakers Wednesday and then LeBron James in the United Center for the first time this season Friday. James also is supposed to wear Chicago Cubs gear in losing his World Series wager to Wade with the Cleveland baseball team facing the Cubs. It was a mistake to challenge Wade, and especially in the second half. 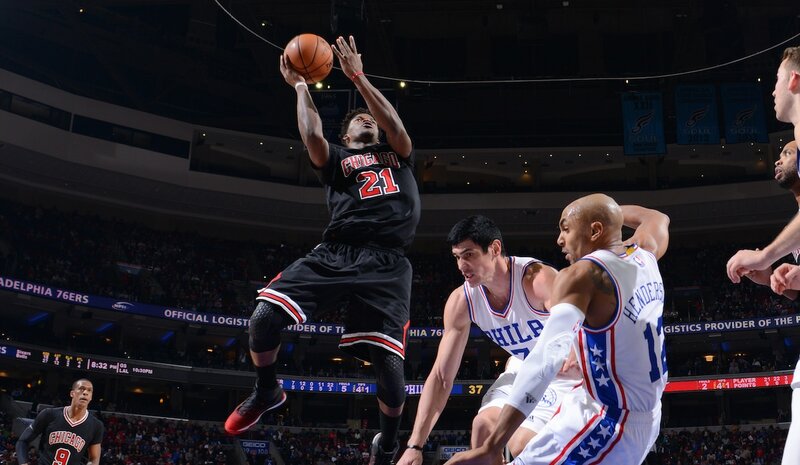 The Bulls dismissed the 76ers midway through the third quarter with Philadelphia hanging on trailing 69-59. After Butler made a pullup, Gibson switched on a hot shooting Nick Stauskas and forced him into a long air ball. Wade got the rebound, threw to half court to Rondo, who threw to the lane to Gibson, who held a moment and passed to Butler flashing down the lane for a layup, the veteran Bulls constantly beating the young 76ers down court. That’s the problem with young teams. They rarely know how to play well and together. So there was a roster of Bulls players averaging more than 30 years old once and again scoring in transition against the roster of lottery picks. Watch out for what you ask for when you ask for so many kids and high draft picks. Wade then spun and was fouled, making a pair of free throws; Rondo drove halfway down the lane to draw the defense and found Wade behind them for a score. Rondo then overplayed reserve point guard Sergio Rodriquez, forcing a bad pass, which Wade intercepted. Wade ran out and passed to a trailing Butler for a layup, the 76ers again beaten down court after a timeout in which they were asked to stop being beaten down court. 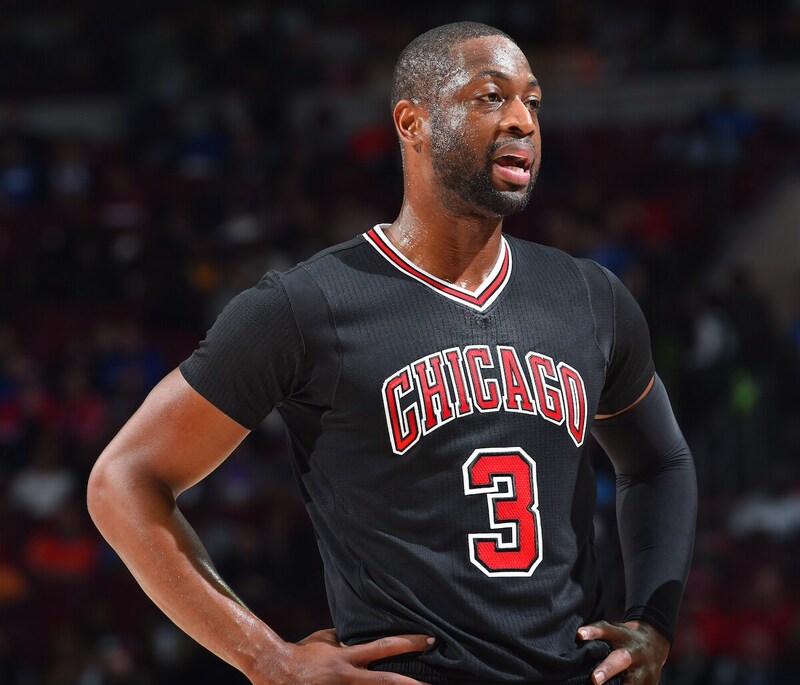 It was effectively about over with an 84-63 Bulls lead with two minutes left in the third quarter. The Bulls exhaled and had a pair of sure fast break scores after turnovers in which they lost the ball making a fourth and fifth pass as they almost seemed to get bored with piling on and wanted to share the offense. Still, they closed the third quarter leading by 26. Then Wade made Bayless call him Mister.